Dr. James Hurley, left, Tusculum University’s president, greets U.S. Sen. Lamar Alexander, center, and Dr. Claude O. Pressnell Jr., president of the Tennessee Independent Colleges and Universities Association. With a touch of reverence and an injection of humor, Tusculum University inaugurated Dr. James Hurley Friday, Oct. 12, as its 28th president and formally launched a dynamic future for the 225-year-old higher education institution. 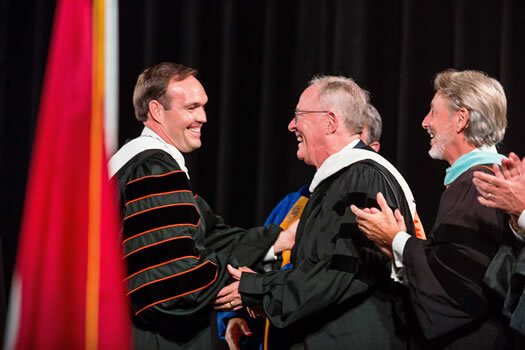 The celebration in Pioneer Arena attracted about 1,000 people to watch U.S. Sen. Lamar Alexander and Dr. Gregory W. Nelson, chairman of Tusculum’s Board of Trustees, conduct the investiture and Dr. Hurley take the oath of office. Dr. Hurley, who has served as president since October 2017, delivered a stirring inaugural address that highlighted how Tusculum is advancing to the next level of excellence. In the audience were Tusculum students, faculty, staff, alumni and trustees, who have experienced Dr. Hurley’s transformative leadership firsthand. They were joined by Dr. Hurley’s family as well as dignitaries from Congress, regional leaders and delegates from colleges and universities throughout the Southeast. On a cool but sunny day, Tusculum celebrated the inauguration with activities that aligned with its Judeo-Christian environment. Hailey Sanders, Student Government Association junior class chancellor, read Ralph Waldo Emerson’s poem “Father, We Thank Thee.” And Ashton Watson, chairman of the campus’ Fellowship of Christian Athletes chapter, read Mark 12:30-31, which commands individuals to love God with all their hearts, minds, souls and strength and to love one’s neighbor as oneself. The audience listened to Dr. Hurley describe exciting initiatives already under way and new advancements on the horizon at Tusculum. One of the most impactful is the proposed college of optometry, which will address the ocular health needs of Appalachia and increased demand for optometrists. Tusculum is engaged with the Accreditation Council on Optometric Educational Board to secure accreditation and projects to have its first class enrolled in 2020. In his speech, Dr. Hurley shared significant news about the optometry school that will contribute to its long-term success. Regionally, he is well-known for establishing the Niswonger Foundation, which funds college scholarships and supports schools at all levels, and was the lead donor for construction of Niswonger Children’s Hospital in Johnson City. Dr. Hurley said Tusculum will explore other new programs that will meet the health care needs of Central Appalachia. He said the university will begin with the establishment of the physician assistant program in 2020 and possibly create new programs in nursing, behavioral health as well as occupational and physical therapy. Tusculum transitioned to university status July 1, and that elevated its stature and empowered it to reorganize the institution into six colleges. Besides the Niswonger College of Optometric Medicine, the university has added the College of Science, Technology and Math and the College of Health Sciences since Dr. Hurley came to the university. The others, which were already in existence, are the College of Business, the College of Education and the College of Civic and Liberal Arts. Dr. Hurley also noted other progress, such as an investment of more than $1.5 million to improve the campus dining experience through a new partnership with Chartwells and the opening of a full-service Chick-fil-A restaurant on campus. A $4.8 million investment to renovate Tredway Hall so it can serve as the new home for the College of Business and College of Education. Another important aspiration is the initiation of the Tusculum 225 – University Rising capital campaign. “Our focus is to increase philanthropic support that will expand our 225-year heritage by increasing scholarship support to reduce student debt, increase faculty and staff support to retain and attract excellent talent and enhance infrastructure to keep our beautiful campus vibrant and attractive,” Dr. Hurley said. He expressed gratitude to all sectors of the audience, including his wife, Kindall, and their three children. But he paid special attention to the students. In providing his charge to Hurley, Alexander touted Tusculum’s roots, which include the university opening two years before Tennessee became a state. He also commended Tusculum for teaching students the importance of giving back, citing the creation of Nettie Day during which they perform community service projects to honor Nettie Fowler McCormick, a Chicago resident who bestowed gifts to Tusculum most of her life. But he also emphasized the talent Dr. Hurley brings to Tusculum. “First, Dr. Hurley knows the territory,” Alexander said. “He grew up in the coalfields of Kentucky. Second, he has a passion for education. He was inspired by his fifth grade teacher to himself become a teacher. He was the first in his family to graduate from college, and then he became president of the university that he graduated from. Six individuals, most with ties to Tusculum, provided greetings to Dr. Hurley and extolled his virtues, including Dr. Nelson, who added some humor to the occasion. Turning serious, Dr. Nelson recalled the goals Dr. Hurley identified during the application process, all of which have been accomplished or are nearing that stage. He said the board was impressed with Dr. Hurley’s credentials, track record and direct approach and said Dr. Hurley convinced the search committee of his capability, energy and passion. A year later, Dr. Nelson said, the board has full confidence in Dr. Hurley. Dr. Nelson reminded Dr. Hurley that the president stands on the tall shoulders of his predecessors, donors, present and former faculty members, the Board of Trustees and Tusculum alumni. Nelson said these visionaries will inspire him to meet the university’s mission. The video of Dr. Hurley’s inauguration is available on Tusculum’s YouTube channel.